Why Do Some Dogs Have Only Three Legs? Do Three-Legged Dogs Have Special Needs? Can a Three-Legged Dog Really Wear a Fake Leg? The correct word for a fake leg is a prosthesis. Dogs can, indeed, wear a prosthesis although it is still unusual and is not necessary for the dog to recover extremely well. When a dog’s leg is amputated, the hip or shoulder joint is often amputated at the same time. 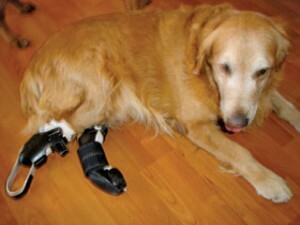 There are good medical reasons to do this, but if it occurs the dog cannot be fitted with a prosthesis later.